We wait anxiously for a resolution to the growing nuclear problem in Fukushima. 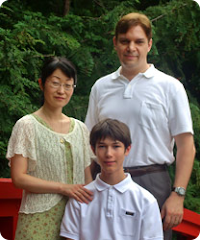 As foreigners leave in droves from Japan, we wonder what God has for us here. Part of us says to evacuate or flee south, too. But our church and Japanese need the hope God brings now more than ever. We have no intention of being foolishly heroic. We are watching the situation carefully and putting together contingency plans. But we feel safe in His care, covered by His wings both night and day. And there's so much opportunity and work to be done now! Today and yesterday we had small group prayer meetings. Many tears, much grief, but also a lot of faith expressed in God. Our baby Christians in the church are really growing up, uniting and comforting each other through this tragedy. It makes this church planter proud to see, but I know it is all the Lord's work in their lives. He is glorifying himself in His church in Japan in a big way right now! Can we see God's saving mercy in this tragedy in Tohoku area? There will be much time to reflect more deeply as stories emerge in the coming weeks and months, but let me share just a little perspective that God gave me yesterday. After WWII, our mission entered Japan and began intense church planting work -- not in heavily populated urban areas, but in the countryside of Japan, Tohoku! Why here and not where the masses were? There the gospel was received readily. Churches were established quickly. We have more than 30 churches in the area devastated by the earthquake and tsunami. It is no understatement to say that this area (the area of current devastation) has been among the most evangelized by our mission. Just as Nagasaki had the longest relationship with the gospel in Japan (500 years) before the atomic bomb fell, so Tohoku has had the longest spiritual opportunity in postwar Japan. And since then, the church there has really worked hard at evangelizing their areas in the last 60 years. It is even reported that one of the Fukushima Fifty (50 workers left in the Fukushima Nuclear Plant trying to avoid meltdown) is a strong believer and leader in his church. God has definitely left a witness. I believe that part of God's plan with all this was to prepare the Japanese people in that area spiritually for this great tragedy. He sent his workers into that harvest field 60 years go to begin reaping the harvest. As Peter 3:9 says, "He is patient, not wanting anyone to perish, but everyone to come to repentance." Click here to see before and after pictures of the area. In my next email I will share a testimony from the pastor of the church just 5 miles from the nuclear facility in crisis. I do not want to SPAM or fill your email boxes, but we are truly desperate for your prayer. This is a historic time in Japan in many ways. Please allow us to email you regularly as we go through this crisis period. Please keep praying! You can impact Japan from your knees right from your home! Additional prayer need: the yen is strengthening (dollar falling) in a big way in the middle of this crisis. This may have long-term impact on many things here. Pray that it will recover to its pre-crisis levels (which was already a major crisis for us missionaries). 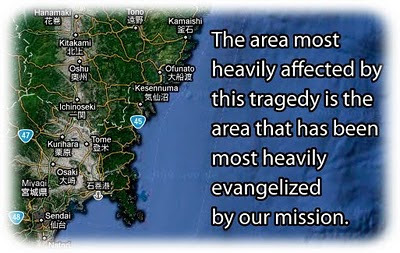 We pray especially that many Japanese would turn to Christ through this crisis. Our God is eager to save! We are hearing reports of spiritual decisions!